Bratislava is the only national capital that borders two other countries. Austria and Hungary flank the city on two sides, and Bratislava was once the capital of the kingdom of Hungary; the Empress Maria Theresa and 10 other sovereigns were crowned in the grand St. Martin’s Cathedral. The fabled Bratislava Castle was once a stronghold of the 9th century Moravian Empire, and has been rebuilt many times since then. It sits on a mound that had once held a Roman settlement. Now the castle houses the Slovak National Museum. The nearby National Gallery and National Sciences Museum also hold interesting exhibitions. The best and most exciting part of the city, though, is its Old Town. The regal architecture of the Primate’s Palace and the Mirbach Palace mark this baroque city with a marvellously open pedestrian centre. 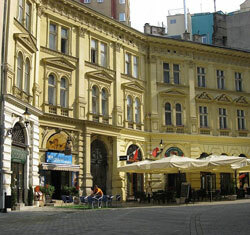 The great restaurants and clubs in the area have also turned it into Bratislava’s exciting nightlife centre. During the Communist regime, Bratislava was the government’s pet project, and large housing projects went up to win the favour of the populace. Stark buildings of the era still stand, uniform grey, tiered blocks that define Bratislava’s skyline. In contrast to these edifices are the city’s grand Gothic churches, its neo-classical manors, and the glittering modernity of tall office buildings and the eye-shaped Danubiana Meulensteen Art Museum, sitting on the thin edge of a peninsula stretching into the Danube very near where the Slovak, Austrian and Hungarian borders meet. The multicultural heritage of the capital is evident in the lingual capacities of its locals, who can speak German, Hungarian, Slovak, and a special dialect stemming from all three languages. Bratislava City lies in the warmest and driest region in the country, leading visitors to comment on its similarity to other cities along the Mediterranean. Bratislava is currently developing into one of the most promising prospects in Europe, with its dynamic and youthful atmosphere beckoning tourists and foreign property investors alike. Perhaps the best place to begin exploring the city is its main square, the elegant, tree-lined Hviezdoslavovo Námestie. From here, you can venture into the Old Town in the north, reach the Danube River in the south, or visit the venerable Bratislava Castle in the west. The Hlavná Stanica located further north is the city’s main train station, and from here you can easily get around town. The city is divided into five districts, from Bratislava I to V.